Parry's first major works appeared in 1880. As a composer he is best known for the choral song "Jerusalem", the coronation anthem "I was glad", the choral and orchestral ode Blest Pair of Sirens, and the hymn tune "Repton", which sets the words "Dear Lord and Father of Mankind". His orchestral works include five symphonies and a set of Symphonic Variations. Both in his lifetime and afterwards, Parry's reputation and critical standing have varied. His academic duties were considerable, and prevented him from devoting all his energies to composition, but some contemporaries such as Charles Villiers Stanford rated him as the finest English composer since Henry Purcell; others, such as Frederick Delius, did not. Parry's influence on later composers, by contrast, is widely recognised. 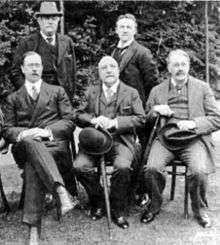 Edward Elgar learned much of his craft from Parry's articles in Grove's Dictionary, and among those who studied under Parry at the Royal College were Ralph Vaughan Williams, Gustav Holst, Frank Bridge and John Ireland. Parry was born in Bournemouth, the youngest of six children of (Thomas) Gambier Parry (1816–1888) and his first wife, Isabella née Fynes-Clinton (1816–1848), of Highnam Court, Gloucestershire. Gambier Parry, the son of Richard and Mary Parry, had been orphaned at the age of five and brought up by his maternal family, adopting their name, Gambier, as part of his surname. 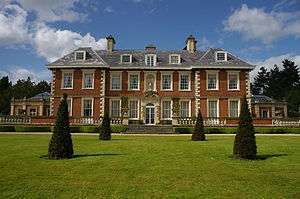 Having inherited enormous wealth from his grandfather, Thomas Parry (a director of the East India Company who died in 1816), Gambier Parry was able to buy a country seat at Highnam Court, a seventeenth-century house near the River Severn and two miles west from Gloucester. Three of Gambier Parry's children died in infancy, and Isabella Parry died of consumption, aged 32, twelve days after the birth of Hubert. She was buried in the churchyard of St. Peter's, Bournemouth, where Hubert was baptised two days later. He grew up at Highnam with his surviving siblings, (Charles) Clinton (1840–83) and Lucy (1841–61). Thomas Parry remarried in 1851, and had a further six children. Isabella's untimely death almost certainly affected her children, most obviously the eldest surviving son, Clinton, who was only seven when she died, and more subtly on Hubert: according to his daughter Dorothea (1876–1963), his stepmother Ethelinda's "love for the young ones", meaning her own children, gave her little or no time for her stepchildren. Gambier Parry was often absent from home, being either away in London or on the Continent. Hubert's early childhood, with Clinton away at school and Lucy seven years his senior, was largely solitary, his only regular companion being a governess. Clinton learned to play cello and piano, and his considerable musical talent became evident ahead of Hubert's. Yet despite their father's active interest in music, such activity was seen as a pastime, and was frowned upon as a career as being too uncertain and, unlike painting, a less than professional pursuit unseemly for a gentleman. [n 1] From January 1856 to the middle of 1858 Hubert attended a preparatory school in Malvern, from where he moved to Twyford Preparatory School in Hampshire. At Twyford his interest in music was encouraged by the headmaster, and by two organists, S S Wesley at Winchester Cathedral, and Edward Brind, at Highnam church. From Wesley he gained an enduring love of Bach's music, which according to The Times "ultimately found expression in his most important literary work, Johann Sebastian Bach, the Story of the Development of a Great Composer (1909)". Brind gave Parry piano and basic harmony lessons, and took him to the Three Choirs Festival in Hereford in 1861. Among the choral works performed at that festival were Mendelssohn's Elijah, Mozart's Requiem, and Handel's Samson and Messiah. Orchestral works included Beethoven's Pastoral and Mendelssohn's Italian symphonies. The experience left a great impression on Parry, and effectively marked the beginning of his lifelong association with the festival. Eton was not at that time noted for its music, despite the interest of a number of its pupils. As there was no one at the school competent enough to advance Parry's studies in composition, he turned to George Elvey, the organist of St George's Chapel, Windsor, and began studies with him sometime in 1863. Elvey was musically conservative, preferring Handel to Mendelssohn, and though Parry initially idolised his teacher, he eventually realised how unadventurous he was compared to S S Wesley. 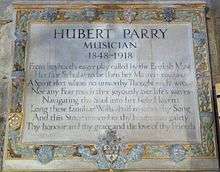 Parry nonetheless benefited from Elvey's tuition and gained the advantage of being able to write anthems for the choir of St George's Chapel, which under Elvey's direction had reached a standard exceptional in English choral singing of that time. Elvey started his pupil on the contrapuntal disciplines of canon and fugue; recognising his pupil's talent, he soon became ambitious to train him to a standard sufficient to earn the music degree at Oxford. He therefore introduced his student to the string quartets of Haydn and Mozart, and ultimately to some of the rudiments of orchestration. Meanwhile, Parry, on his own initiative, explored the orchestral scores of Beethoven, Weber, and his beloved Mendelssohn. While still at Eton Parry successfully sat the Oxford Bachelor of Music examination, the youngest person who had ever done so. His examination exercise, a cantata, O Lord, Thou hast cast us out, "astonished" the Heather Professor of Music, Sir Frederick Ouseley, and was triumphantly performed and published in 1867. In 1867 Parry left Eton and went up to Exeter College, Oxford. He did not study music, being intended by his father for a commercial career, and instead read law and modern history. His musical concerns took second place during his time at Oxford, though during one summer holiday, acting on the advice of S S Wesley, he went to Stuttgart and studied with Henry Hugo Pierson. As Parry recalled, Pierson's prime aim appeared to be "to disabuse me of Bach and Mendelssohn", and he set Parry the task of reorchestrating works by Weber, Rossini and Beethoven, as well as some of Parry's own works. Parry came back to England much more critical of Mendelssohn's music, and discovered more adventurous repertoire through attending concerts at London's Crystal Palace: he was particularly taken by Schumann's Second Symphony, with its "wildly glorious" Scherzo and the slow movement's "delicious" orchestration and "most wonderful ... modulation". He went into raptures about Beethoven's Sixth and Eighth symphonies, confessing in his diary: "I can hardly bear to hear or smell a large work by Mendelssohn in the same week as a great work of dear old Beet." Yet, as Dibble notes, Mendelssohn's influence on Parry's own music persisted. Parry continued his musical studies alongside his work in insurance. In London he took lessons from William Sterndale Bennett, but finding them insufficiently demanding[n 3] he sought lessons from Johannes Brahms. Brahms was not available, and Parry was recommended to the pianist Edward Dannreuther, "wisest and most sympathetic of teachers". Dannreuther started by giving Parry piano lessons, but soon extended their studies to analysis and composition. At this stage in his musical development, Parry moved away from the classical conventions inspired by Mendelssohn. Dannreuther introduced him to the music of Wagner, which influenced his compositions of these years. Following the death of his stepmother, Ethelinda Lear Gambier-Parry, in 1896, Parry succeeded to the family estate at Highnam. He was created a Knight Bachelor in 1898 and a baronet in 1902. Parry resigned his Oxford appointment on medical advice in 1908 and, in the last decade of his life, produced some of his best-known works, including the Symphonic Fantasia 1912 (also called Symphony No. 5), the Ode on the Nativity (1912) and the Songs of Farewell (1916–1918). The piece by which he is best known, the setting of William Blake's poem "Jerusalem" (1916), was immediately taken up by the suffragette movement, with which both Parry and his wife were strongly in sympathy. In the autumn of 1918 Parry contracted Spanish flu during the global pandemic and died at Knightscroft, Rustington, West Sussex, aged 70. At the urging of Stanford, he was buried in St Paul's Cathedral. The site of his birthplace, in Richmond Hill, Bournemouth, next door to the Square, is marked with a blue plaque; there is a memorial tablet, with an inscription by the Poet Laureate, Robert Bridges, in Gloucester Cathedral, unveiled during the Three Choirs Festival of 1922. Parry's baronetcy became extinct at his death. Highnam passed to his half-brother, Major Ernest Gambier-Parry. ↑ Clinton's musical talent developed further during his time at Eton, though his surviving diary records his severe depression following his father's disapproval of both his musical activity and, more seriously, his loss of religious faith. His musical ambitions increased further as a student at the University of Oxford: his time there started auspiciously with his performing several times before the Prince of Wales, including a number of his own compositions. ↑ The elder daughter, Dorothea (1876–1963), married the politician Arthur Ponsonby in 1898, and had a son and a daughter. The younger daughter, Gwendolen Maud (1878–1959) married the baritone Harry Plunket Greene (1865–1936) and had two sons and a daughter. ↑ Parry wrote, "He was kind and sympathetic, but he was too sensitive ever to criticize". ↑ The term originated in an article by the critic Joseph Bennett in 1882. In his review in The Daily Telegraph of Parry's First Symphony he wrote that the work gave "capital proof that English music has arrived at a renaissance period." J A Fuller Maitland, chief music critic to The Times, became the most assiduous proponent of the theory, in his 1902 book English Music in the XIXth Century. ↑ "Parry, Charles Hubert Hastings (PRY883CH)". A Cambridge Alumni Database. University of Cambridge. 1 2 "Highnam Court, Gloucester, England". Parks and Gardens UK. Retrieved 27 April 2013. 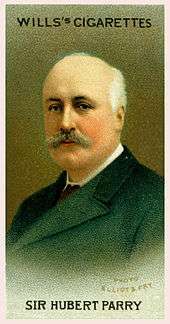 ↑ "Sir Hubert Parry's earliest works discovered". BBC News. 18 May 2015. Retrieved 15 April 2016. ↑ Elliott, Valerie (22 March 2015). "'Jerusalem' composer's first recital...150 years on: Prince Charles to attend premiere of previously unplayed works before auction". Mail Online. Retrieved 16 April 2016. ↑ "Latest News". Chorley's Auctioneers. Retrieved 19 May 2015. Shaw, Bernard; Dan H Laurence (ed) (1989). Shaw's Music – The Complete Music Criticism of Bernard Shaw, Volume 2. London: The Bodley Head. ISBN 0370312716. Slonimsky, Nicholas; Laura Kuhn (eds) (2001). Baker's Biographical Dictionary of Musicians, vol. 4. New York: Schirmer Reference. ISBN 0028655281. Vaughan Williams, Ralph; David Manning (ed) (2007). Vaughan Williams on Music. Oxford: Oxford University Press. ISBN 0199720401.